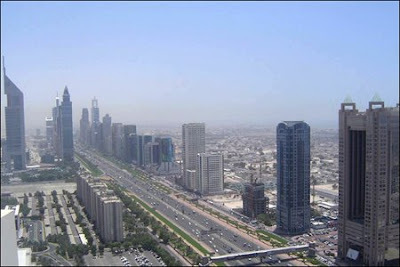 Dubai is one of the 7 emirates of the United Arab Emirates. It is the largest by population and second largest in surface area. UAE as a country is bordered with Saudi Arabia and Oman on the Arab Peninsula as well as lying on the Persian Gulf. Dubai is different from the other emirates in that it only receives 6% of its revenues from oil, rather most of the money generating sources have been from tourism and the services industry. Dubai is the City built for Tourism all around the year with excellent Hotels, Resorts, Shopping and Sports facilities available throughout the year. A relatively new tourist destination, Dubai has gained in popularity in recent years. It is essentially a desert city with superb infrastructure, liberal policies (by regional standards), and excellent tourist amenities. Just 5 hrs from Europe and 3 hrs from most parts of the Middle East, the Near East, and the sub-continent of India, Dubai makes a great short break for shopping, partying, sunbathing, fine dining, sporting events, and even a few sinful pleasures. It is a city of superlatives: for the fastest, biggest, tallest, largest and highest, Dubai is the destination. Burj Dubai is a skyscraper currently under construction and is currently the tallest man-made structure on Earth. Construction began on September 21, 2004, and it is expected to be completed and ready for occupation in September 2009. 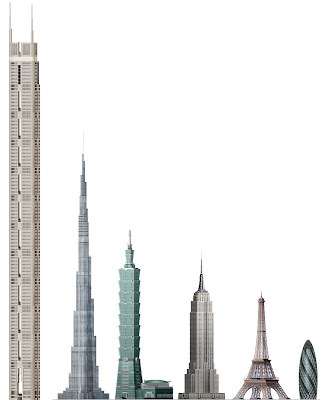 Burj Dubai now has 164 floors (04.14.08), and 636.9 m tall. The one and only remaining record to be broken is the height of the collapsed Warsaw radio mast, which used to be 646.38 metres tall until August 8. 1991. 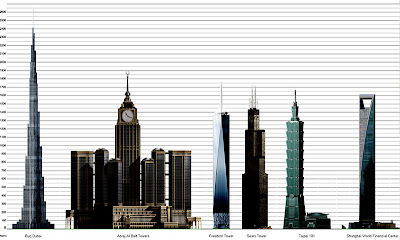 One website mentions a rumoured final height of 800 - 950m. The highest resolution photo of Burj Dubai you can find Here Or click here to reach an official website. Fueled by the engineering expertise and imagination of Nakheel, The World rises from the sea with velocity and momentum, with 94% of the islands already reclaimed. Each and every day, The World moves closer to becoming the most exclusive destination on earth.The World is a man-made archipelago of 300 islands constructed in the shape of a world map and located 4 kilometres (2.5 miles). Land reclamation on the World is nearly complete and should be finished in 2008. Dubailand. What is Dubailand? Dubailand part of Tatweer (which belongs to Dubai Holding), is an entertainment complex under development in Dubai, United Arab Emirates. Construction of Dubailand has been divided into four phases. Work is currently being carried out on phase one of the project which is expected to see completion some time between 2008 and 2010.Spanning 107 square miles, the venture is expected to cost $20 billion. It will include 45 mega projects and 200 sub projects. It will be more than twice the size of all of the Disneyland/Disney World resorts put together, currently the largest collection of theme parks and attractions in the world. Ski Dubai in Dubai Emirates Mall started in December 2005 is the worlds third largest indoor ski slope, measuring 400 meters and using 6000 tons of snow. Ski Dubai resort is the first Dubai indoor ski slope to open. 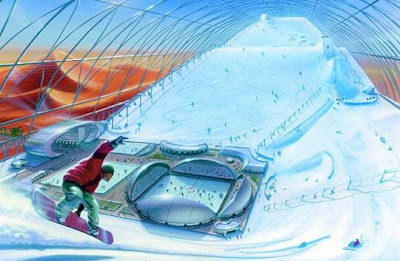 A second Dubai indoor ski slope is the Dubai Sunny Mountain Ski Dome in Dubailand which is due to open in 2008. It will provide a great attraction, featuring a revolving ski slope, an artificial mountain range, an ice bridge, a cable lift, a snow maze, an ice slide, polar bears cold water-aquaria and special sound and light effects. 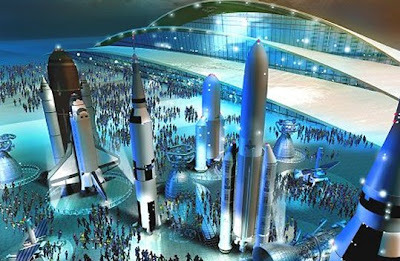 Space Science World one of the biggest attraction of Dubai Land park. 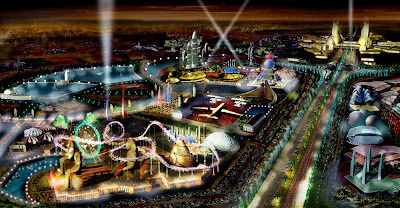 The Restless Planet is an educational theme park currently under construction at the City of Arabia in Dubailand. Restless Planet offers the world’s ultimate theme ride back into the mists of time – through the state-of-the-art electronics of today. 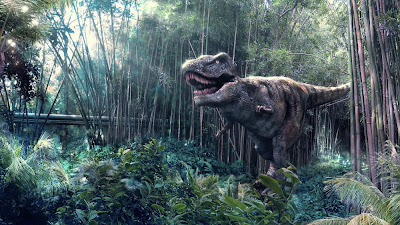 Here, in the glittering new City of Arabia, you are transported back millions of years into the prehistoric kingdom of the dinosaurs. 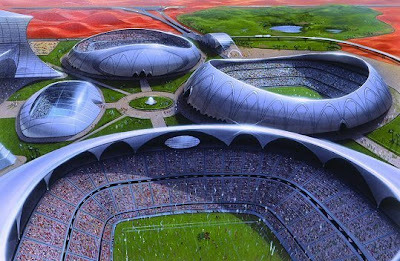 The Dubai Sports City is an entire sports city currently being constructed in Dubai, United Arab Emirates. Construction of Dubai Sports City is well under way and with the first sports facilities and homes being completed by late 2007, the future of sport and the future of living is nearer than you might think. 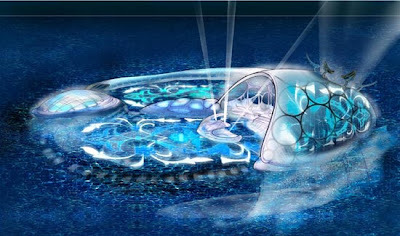 The Resort is a planned hotel which will be the world's first underwater luxury resort. It's situated 66 feet below the surface of the Persian Gulf, just off Jumeira Beach in Dubai. Hydropolis in Dubai is the world's first luxury underwater hotel. The upper storeys of the land station house a variety of facilities, including a cosmetic surgical clinic, a marine biological research laboratory and conference facilities. 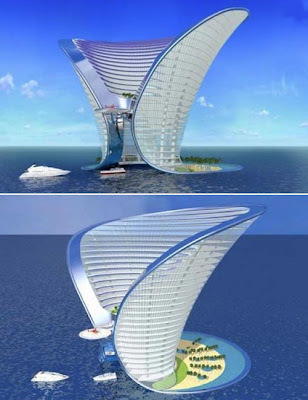 The Apeiron Hotel’ will be a 7-star hotel built on an island off of Dubai. The arched 185 meter tall hotel will cost $500 million USD. 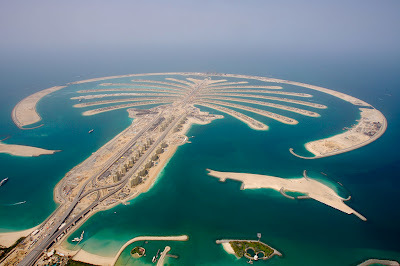 The Palm Jumeirah ( Coordinates: 25°06′28″N, 55°08′15″E ) consists of a trunk, a crown with 17 fronds, and a surrounding crescent island that forms an 11 kilometer-long breakwater. The island itself is 5 kilometers by 5 kilometers. 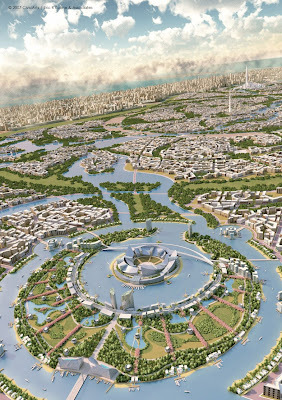 It will add 78 kilometers to the Dubai coastline. The first phase of development on the Palm Jumeirah will create 4,000 residences with a combination of villas and apartments over the next 3 to 4 years. 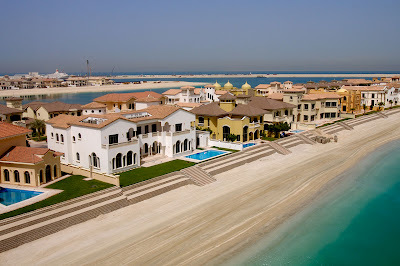 Residents began moving into their Palm Jumeirah properties at the end of 2006, five years after land reclamation began, according to project developer Nakheel Properties. This signaled the end of phase one of construction, which includes approximately 1,400 villas on 11 of the fronds of the island and roughly 2,500 shoreline apartments in 20 buildings on the east side of the trunk. Nakheel Properties will mark the arrival of the first residents by bringing one of the world's largest airships to Dubai. It has agreed to a deal with Airship Management Services Inc. for a 197 feet (60 m) long, 250,000-cubic-foot (7,100 m³) Skyship 600 dirigible. 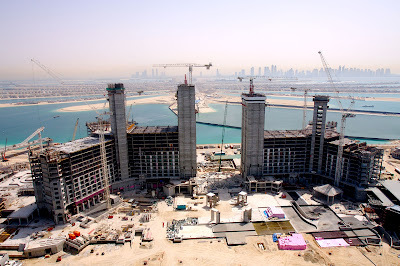 According to Nakheel Properties officials, the process of adding 78 kilometers of beach is under way, while eight of the 32 hotels on The Palm Jumeirah have begun construction, including the Taj Exotica Resort and Spa, which is planned for completion in late 2008 or early 2009. 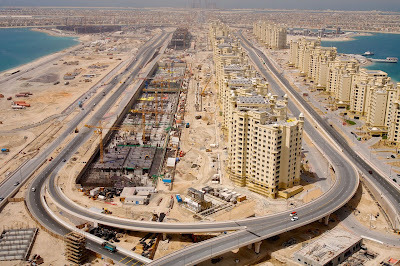 The first phase of Atlantis, The Palm, is scheduled to be completed by December 2008. The "Golden Mile", the strip of land located along the center of the trunk overlooking the canal, is set for completion in the first quarter of 2008. Construction has also begun on the Palm Monorail, which will take three years to complete and will serve as a transit system between the Gateway Station at the trunk of The Palm Jumeirah and the Atlantis Station on the crescent. (Emirates News Agency, WAM). As of early October 2007, construction of the island was on schedule. The breakwater was completed in December 2006, and infrastructure work began in April 2007. Major construction will not begin until most of the infrastructure work is complete. 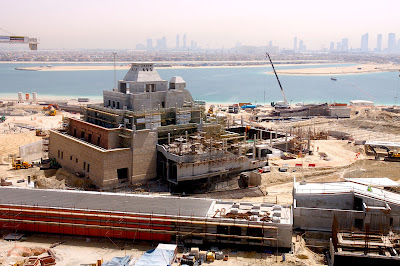 One of the first buildings on The Palm Jebel Ali is already known. 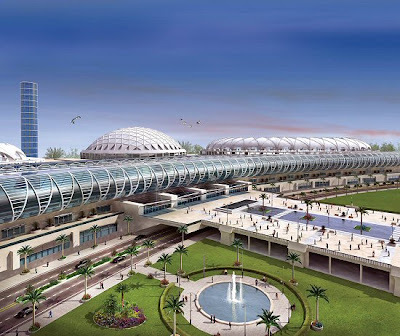 Nakheel invited several architects to design a building on a 300,000m² area. 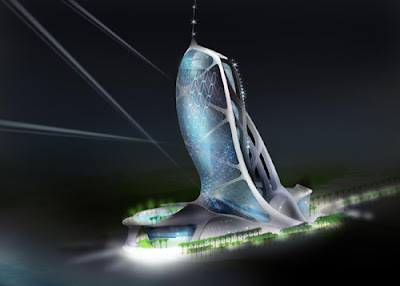 The winning design was a building by Royal Haskoning, who also worked on several other projects in Dubai. The building can be seen here. In 2012, the first phase of four theme parks will open on the Crescent. These parks, which together will be called "World of Discovery," will be developed and operated by the Busch Entertainment Corporation. The parks include SeaWorld, Aquatica, Busch Gardens and Discovery Cove. The World of Discovery will be located at the top of the Crescent, which will form into the shape of an orca (reminiscent of Shamu). 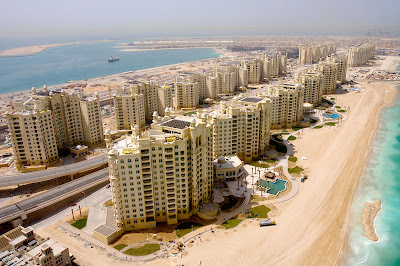 The Palm Deira was announced for development in October 2004. 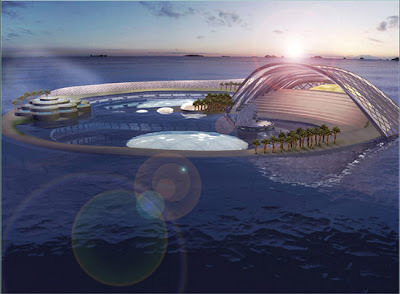 Upon completion, it will become the world's largest man-made island, housing more than a million people. Although no timetable for completion has been announced, it is expected to be finished by 2015. 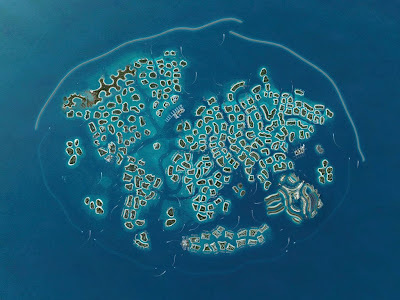 This island is 8 times larger than the Palm Jumeirah, and 5 times larger that the Palm Jebel Ali. 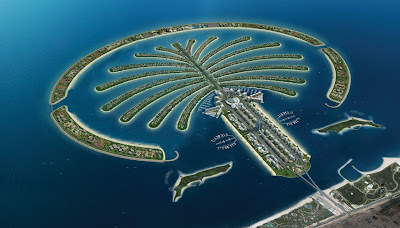 Originally, the design called for a 14km (8.7 mile) by 8.5km (5.3 mile) island with 41 fronds. Due to a substantial change in depth in the Persian Gulf the further out the island goes, the island was redesigned in May 2007. The project then became a 12.5km (7.76 mile) by 7.5km (4.66 mile) island with 18 larger fronds. It will be located alongside Deira. By early October 2007, 20% of the island's reclamation was complete, with a total of 200 million cubic metres (7 billion cubic feet) of sand already used. 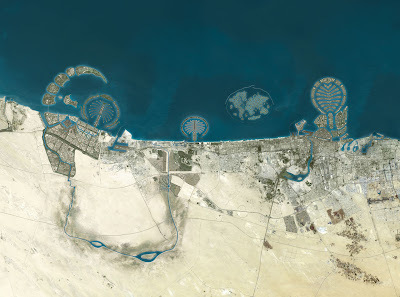 Then in early April 2008, Nakheel announced that more than a quarter of the total area of the Palm Deira had been reclaimed. This amounted to 300 million cubic metres (10.6 billion cubic feet) of sand. Since the island is so large, it is being developed in several phases. 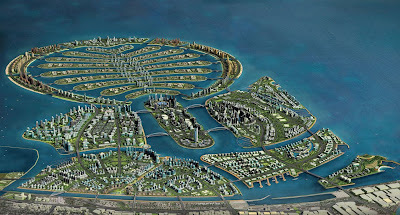 The first one is the creation of Deira Island. This portion of the Palm will sit alongside the Deira Corniche between the entrance to Dubai Creek and Al Hamriya Port. Deira Island will act as "the gateway to The Palm Deira" and help to revitalize the aging area of Deira. 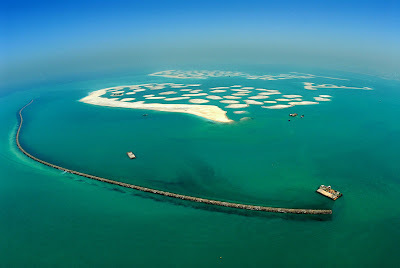 By early April 2008, 80% of Deira Island Front's reclamation was complete. 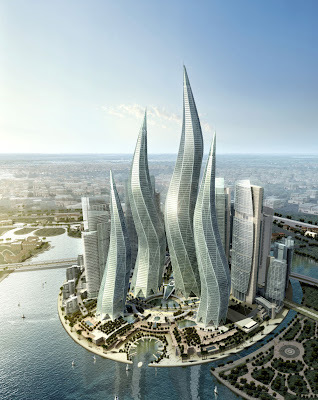 Dubai Towers Dubai is a four tower complex proposed in the city of Dubai, United Arab Emirates. 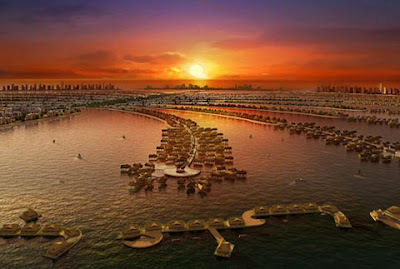 The developer, Sama Dubai, intends this to form the centrepiece of The Lagoons, a megaproject located on Dubai Creek which will consist of seven islands. 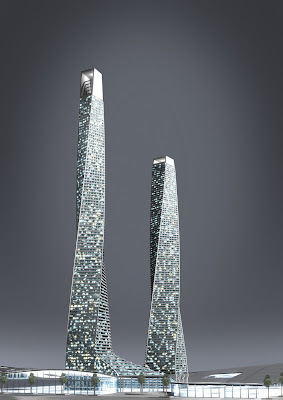 The towers have between 57 to 94 stories and although the heights are not known, it is believed the tallest will top 400 metres (1,310 ft) while two others will exceed 300 metres (980 ft). 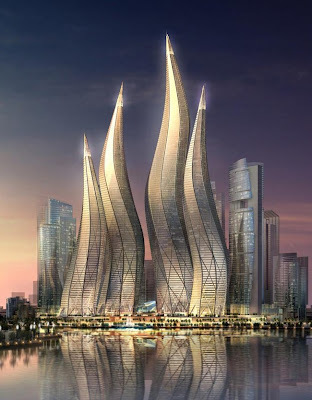 Designed by Thompson, Ventulett, Stainback & Associates, these towers are intended to create a dramatic new landmark for Dubai. Their design represents the movement of candlelight and according to Thompson, Ventulett, Stainback & Associates, this is supposed to symbolise hope, harmony, growth and opportunity. They will contain offices, apartments, hotel rooms, retail, entertainment, gymnasiums, health spas and a variety of other services. Dubai is a fascinating beach holiday destination and sparkling city that will amaze you and transform your dream holiday ideas forever. Dubai, a fishing village turned one of the most prosperous lands in the world. Your information about the entire activities about Dubai is thought provoking and pleasant for those who are visiting for the 1st time and i hope that this trend of highlighting countries for lay man like me will be conducive.